Well, it's taken a while, but I finally made my decision on my first home theater screen. It was a difficult choice that has taken months of research, with many issues to resolve. I also decided that I wanted to run my theater system from a computer, removing as much video processing as possible from the internal projector electronics. This allowed me to buy a projector that had most of it's development costs focused on the light projection technology itself. It also gives me much more flexibility and a significant picture quality improvement if I run my own external hardware and software on a PC to maximize the picture resolution, and to deploy enhancements as they become available, thereby lessening the obsolescence factor. It is possible to get better results from a dedicated PC, since the processing power is considerably greater than anything a manufacturer can hope to include in the cost of projector production. This type of use for computers has created a whole new field, often referred to as HTPC (Home Theater Personal Computer). I'm looking forward to playing with some of the advanced software such as WinDVD Platinum. The most economical way to get a big screen that disappears when not in use, is to use a front projector - hence my decision to purchase the BenQ PB 6200 DLP front projector. I chose the DLP technology over LCD and LCoS because of issues concerning brightness, contrast, longevity and initial investment. I picked it up online for around $1700, which included a spare lamp bulb (a $400 value). The spare bulb bundle offer ends at the end of April, but even without it, this projector is an excellent value - you won't find a better buy anywhere. I see that the price has dropped considerably since I bought it. My projector was shipped the day after I placed the order - pretty good, I thought, especially considering the high demand for this unit! For around $30, I picked up a 10 foot diagonal bright white roll-up screen (gain of about 1.2) that will cover the end wall in my great room. You can find rolled projector screen material on Ebay. I may also convert it to a motorized, remote controlled, retractable unit, using X10 switch modules and a motorized drapery controller to raise and lower the screen (for more info on the incredibly useful x10 technology, see our home page). I'll use the DVD in my laptop as a video source for now, as I examine some of the amazing software available for enhanced home theater use. Once I have experimented with the output from my laptop and decided on my processing needs, I'll probably buy an inexpensive re-certified off-lease laptop and use it as a dedicated HTPC. The HTPC experience will be the basis for another forthcoming article, and between now and then I'll figure out if I really need to buy a regular desktop case PC instead. City of Industry, CA (Feb. 24, 2004) - BenQ, a leading manufacturer of DLP™ based digital projectors, introduced its latest digital projector with the PB6200. The PB6200 is a sturdy, yet lightweight digital projector that is ideal for a variety of professional and personal home theater applications and installations. Perhaps the most significant missing feature is the DVI digital input on this unit; only analog RGB, component, composite, and S video inputs are present. This may sound like a major item, but it's important to remember that digital HDTV sources are not widely available yet. In anticipation of this screen purchase, I recently bought from my so called 'digital cable' service a Motorola 2500 cable converter. It doesn't have a digital output. I later discovered that I could pay them an extra per-channel monthly fee for each of the few local HDTV broadcast channels, but I'd also have to buy another expensive digital output converter from them, just so I can watch commercials in high resolution. Thanks, but no thanks! Our main usage is watching film laid on DVD, and it's important to understand that the current DVD format is not HDTV. 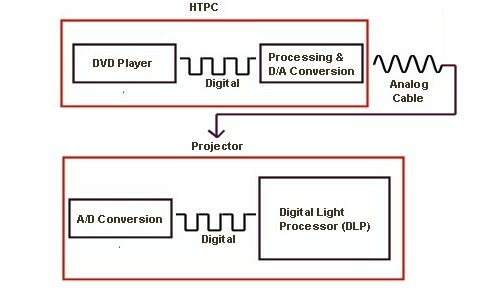 It is a relatively high resolution digital format (DTV), but the HDTV higher definition encoding will only appear in the next generation of DVD players. By the time that happens, I'll be ready for a screen upgrade anyway, and I will get digital inputs at that time. The current DVD format is digital, so I will be putting up with the slight degradation introduced by the digital-to-analog conversion RGB output on the VGA monitor connector of my HTPC (and the subsequent analog-to-digital re-conversion inside the the projector). Nevertheless, this picture is still very sharp, with excellent color saturation, and I plan to introduce numerous software image enhancements via my laptop, such as 'high end' de-interlacing and scaling. Keep in mind that it is a big advantage to process the video within the digital realm, as it comes off the DVD player inside the HTPC, before it is finally converted to analog at the output and sent to the projector. All things considered, this really wasn't too much of a sacrifice, considering the cost. 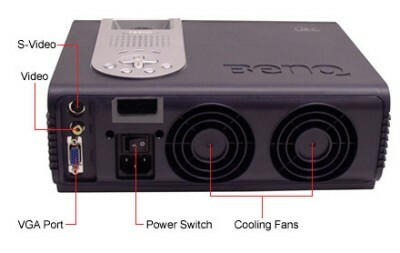 Yes, there are other projectors out there that have DVI digital inputs and the excellent Faroudja de-interlacing scan doubler, but they are typically twice the price and more, with equivalent specs. I also like the idea of keeping the processing external, so that I can upgrade the picture as the software improves. This unit does have internal processing, but I'll be bypassing it in favor of the more powerful systems I can deploy in my laptop, such as WinDVD Platinum. My feeling about HDTV is that it is NQTY (Not Quite There Yet) and when it finally becomes the norm, keeping the video signal entirely within the digital realm will be much more important. Also, for those of you using a stand-alone DVD player instead of an HTPC, keep in mind that very few of these units are produced with a digital output at this time, so purchasing a display with a DVI digital input may not make much sense unless you were planning to keep it for a long time (anticipating future use). Also keep in mind that a digital image isn't necessarily better than an analog image - in some cases it can be worse. An HDTV picture can also be analog; Japanese HDTV is broadcast using an analog signal. If you decide to purchase a unit with a DVI digital input, you may also want to check to see if it supports the HDCP copy protection protocol, and which flavor, as there is a standards war going on at the moment (you could end up with a DVI input that is obsolete). If it doesn't, you could end up with a reduction in quality on copy protected material. The copy protection and standards incompatibility problems can be avoided entirely by using an HTPC as your video source. I also compromised somewhat in the area of brightness vs contrast. I wanted a high contrast unit, for sure, but I also wanted to be able to watch a movie without putting up blackout curtains in our great room. 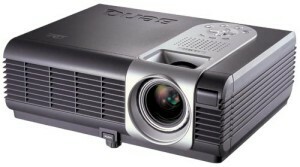 The 2000:1 contrast of the PB 6200 is quite high, and although other projectors are reaching into the 3000:1 realm with this DMD chipset, they do this by stopping down the projector iris, thus lowering the brightness in favor of contrast (they are still only typically running at 2000:1 with the iris fully open). The 1700 lumens rating of this unit is quite high, and should work well in a partially lit environment. A further compromise consideration was the speed of the spinning color wheel in single chip DLP projectors (used to create the 3 primary colors: red, blue, green). Most of the lower priced units use a 2x speed, whereas this BenQ unit has a 3x wheel. This should reduce or eliminate the so called 'rainbow effect' motion artifacts attributed to this type of projector (also considering the DDR [Double Data Rate] of this latest DLP chip), although the more expensive units are running at 5x and 6x speeds. I wasn't particularly bothered even by 2x color discs, but some people are more sensitive to this anomaly than others, so you should always look at a DLP projector (front or rear projection) before you buy, to determine your tolerance level. Buying a 3 chip DLP projector would also be an option (eliminating the color wheel altogether), at about 5 times the price. I could have made a further compromise in the area of resolution by purchasing an SVGA projector (800x600 pixels), but I run my computers at XGA (1024x768) and I didn't see the logic in that, since I'm using the DVD in my computer as the primary video source. I also chose a native 4:3 aspect ratio, even though I'll be watching a lot of 16:9 sources. I found that these projectors were less expensive, and actually displayed the same vertical resolution at 16:9 as the the new 'Mustang' DMD chip that runs in native 16:9. It also has the benefit of displaying 4:3 sources at a larger size and/or higher resolution. My next articles will cover more about the projector setup, video and sound processing, and what can be done on an HTPC to enhance the picture and sound quality. (Author's note May 6/04: The projector arrived yesterday; preliminary results were outstanding, see the NEXT ARTICLE about setting it up).